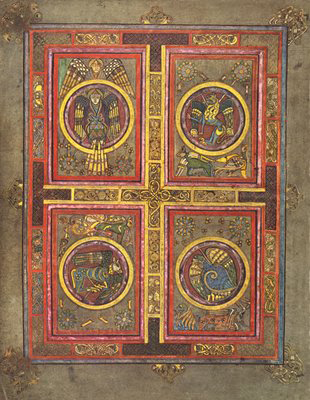 The Book of Kells is one of Ireland's best-known attractions. It is currently housed in the Long Roomof the Old Library in Trinity College, Dublin. The Book is an illuminated manuscript, which means it was written and illustrated by hand and exquisitely adorned with color. The text consists of the four gospels of the New Testament, written in Latin.While much research has been undertaken on the book, surprisingly little is know about its origins. Historians have speculated that it was written by St Columba's monks on the island of Iona, off the coast of Scotland, around 797AD to mark the second centenary of his death. This however is far from certain. In 805, Iona was the plundered by Viking raiders. While the manuscript survived this particular threat, the gold and silver binding in which it was probably set, was stolen by the raiders, who in all likelihood melted it down to make coins. The fleeing monks probably sailed back to Ireland, to set up a new monastery in Kells, and although this was repeatedly plundered throughout the tenth, this time at the hands of the Danes, somehow the book survived. It was kept in the monastery until the 17th century, when fearing for its safety the governor of Kells sent the book to Trinity College, to protect it from Cromwell's soldiers. The pages of the book are made from the skins of an estimated 185 calves. It's likely that several monasteries pooled their resources, and shared their calfskins in making the book. The pigments used come from variety of sources, and the geographical spread of sources, point to a fairly sophisticated trade system being used by the monks. While many of the pigments were made using locally available materials, some of the ingredients came from sources such as pregnant Mediterranean insects, flowers from northern Europe, and even precious stones found only in Afghanistan! But it is the beauty of the lavish decorations that embellish the text, which sets the Book of Kells apart from similar manuscripts. The illustrations number in their thousands, and range from the elaborated initial letters on each page, to full page, or 'carpet' illustrations. The monks drew heavily on animal imagery, lending an almost pagan quality to the book. Historians believe that the monks had access to artwork from the east, and the influences these had on the illustrations in the book is apparent.